Because cats, dogs, bunnies and other pets look adorable dressed as Santa, angels, elves, reindeer and the like, why not throw a party with a contest for folks who share photos of their beloved family pets dressed in holiday getups? Imagine a bunch of grown ups gathering to show off their puppies and kitties? If you’re so inclined, you could set up a screen in a viewing room so people can vote live from Facebook or Flickr. The prizes can be very simple, like cat toys or a dog bone or gift certificates. 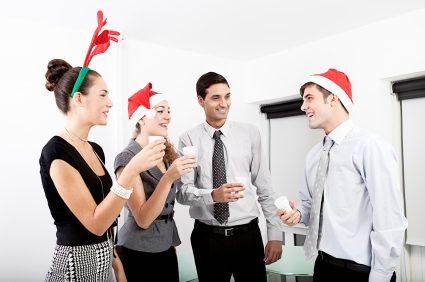 Invite your employees to a party that’s really innovative: a Holiday (Virgin) Cocktail Potluck. You provide the snacks, and they bring their favorite holiday cocktails: Chocolate martini, candy cane martini, eggnog, spiked cocoa, pumpkin pie, minted sake and pineapple cooler, you get the idea. Be sure there are designated drivers if you are serving real alcohol. This will be a rowdy party with lots of singing and dancing regardless. Some folks celebrate “Christmas in July,” so why not try a warm-weather themed party during winter with a Tropical Christmas celebration? Instead of pine trees and red velvet suits, how about palm trees and shorts? You can still have a gift exchange, sing carols and serve snacks, but with a twist. Break out the umbrella drinks, grass skirts and hula dancing. If you wish, you can still hold a Secret Santa or Yankee Swap. Break out the beach balls, virgin margaritas, and maybe even hold a Gilligan’s Island look-a-like contest. Thanks to Seinfeld most of us know about “re-gifting:” taking a gift we received and didn’t like and giving it to someone else. This practice used to be abhorrent, but now it has become acceptable as long as the gift has never been opened or used. So, how about throwing a Christmas party where everyone who shows up brings a present for “re-gifting”? You might not believe how much fun this can be! Never in one place will you find more white elephant gifts. Invite your friends with their denim pyjamas, leopard-print Snuggies, Homer Simpson Chia Heads, smokeless ashtrays, and camouflage Crocs. It’s your choice to wrap the gifts or simply put them in plastic bags. Just have fun! Why not host a party where folks bring their salt dough Christmas ornaments? You can use cookie cutters for the designs and acrylic paint to decorate. Invite them to have the kids help. And if you wish, hold a contest to see who made the most charming, lovely, funny, and beautiful ornaments. All of them will make it to the tree. Whatever you decide to do to celebrate the holidays at the office, be sure to tell the people you work with that they are appreciated. I little bit of gratitude goes a long way. This entry was posted on Monday, November 30th, 2015 at 12:34 pm	and is filed under Business Advice, Christmas, Office Relations. You can follow any responses to this entry through the RSS 2.0 feed. You can leave a response, or trackback from your own site.